"In the sea-sand of Rimini… there can be found lots of ammonites and nautilus same, small, multi-chambered bivalves… So PLANCUS found in 6 ounces* of marine deposits 618 specimens of Nautilus calcar, 130 Nautilus crispus, 6700 Nautilus becarii, 900 N. raphanus and 4 N. radicula, in sum 8.452 individuals, They seem in part similar to the nummulites and other petrifaction and are been described and depicted by PLANCUS, FICHTEL, MOLL and d´ORBIGNY , but still not sufficiently investigated." Fig.1. Portrait of Ambrogio Maria Soldani. 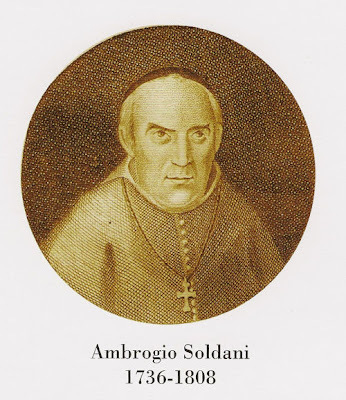 It was the Italian Abbot Ambrogio Maria Soldani (1736-1808) who as first published an extensive research dedicated to the small fossils found in the Pliocene and Pleistocene sediments of Tuscany. Soldani was anointed abbot in 1776, four years later he bacame the superintendent of the monastery of Santa Mustiola in Siena, teaching philosophy, theology, but also chemistry and natural sciences (a not unusual combination for these times). During his career he visited and studied many geological localities in Tuscany, Central and South Italy, also in Germany and Austria. 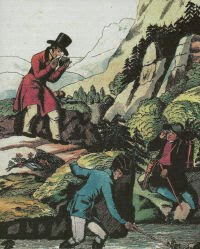 In 1780 he published a preliminary "Saggio Orittografico" (The Written report), where he describes various fossil bearing localities and explains the geology of Tuscany. 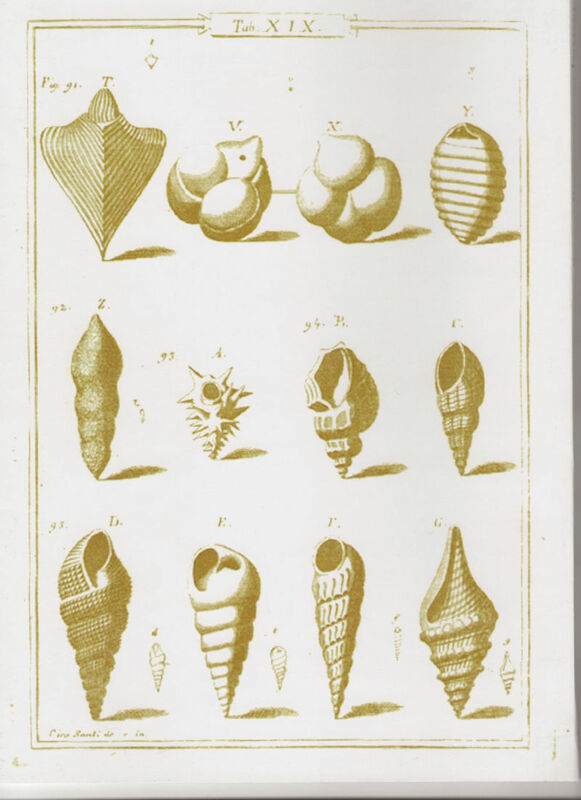 The “science of shells” impressed his contemporaries, and the earl of Tuscany, Pietro Leopoldo, nominated Soldani to “professor of mathematic sciences” of the University of Siena, one of the most important institutions of the time. Soldani continued his studies and travels, but despite the preliminary success, to complete his second work he had to demand various loans and even pawn the work in progress. Between 1789 and 1798 he published "Testaceographiae ac Zoophytographiae parvae et microscopicae”, a monumental work where he reassumed 27 years o research. This book contains many plates with gorgeous drawings of microfossils as they appear under the microscope (see figures 2. and 3.). Among them, many Foraminifera were illustrated. 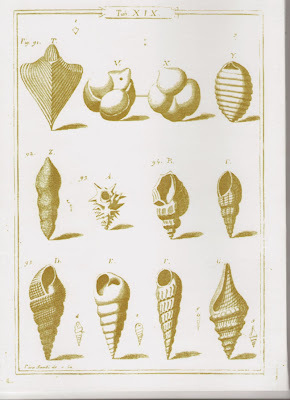 In his study of rocks, Soldani noted small shells embedded into the sediments, these organisms where similar, but not identical to the shells of living animals he also found in recent sand and rocks of the sea. 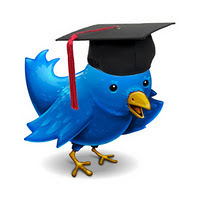 Nevertheless he concluded that studying the latter, it was possible to deduce the environment in which the former lived, and so doing interfere the conditions of formation of the sedimentary rocks. Unfortunately the restricted geological knowledge of the time didn’t allow such considerations, the work was profoundly misunderstand and finally ignored. Soldani was deeply disappointed, and in an attempt to destroy his work he burned many copies of the printed book and sold the metallic print-plates of the figures to an artisan specialized in the repair of pots. He continued his work on geology, palaeontology and even on meteorites, rocks he recognized not of terrestrial origin, but these observations only enforced the aversion against him - his reputation was ruined and his work got underappreciated. 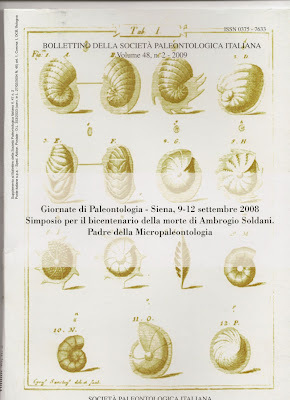 Today Ambrogio Maria Soldani is rightly considered, with another Italian naturalist - Jacopo Bartolomeo Beccari, as father of micropaleontology. Only a small number of animals are so well studied as foraminifers, since 1935 the research on these unicellular, widespread and stratigraphically distinctive organisms literally exploded. Fig.2. Frontcover of the volume dedicated to Soldani by the Italian Paleontological Society for the bicentery of his dead. The figure shows various species of foraminifers as depicted in "Testaceographiae ac Zoophytographiae parvae et microscopicae." Fig.3. Backcover, dominated by the illustrations of mollusc shells and in the first rows four foraminifers and the oogonium of an algae (Characeae). Societá Paleontologica Italiana ed. (2009) : Giornate di Paleontologia - Siena, 9-12 settembre 2008. Simposio per il bicentenario della morte di Ambrogio Soldani. Padre della Micropaleontologia. Bollettino della societá paleontologica italiana. Vol. 48(2). LOEBLICH, A.R. & TAPPAN, H. (1998): Foraminiferal genera and their classification - Textband und Bildband. Nostrand Reinhold Company - New York. LOEBLICH, A.R. & TAPPAN, H. (1964): treatise on invertebrate paleontology - Part C, Protista 2. Vol.1 + 2. Geological Society of America, University of Kansas Press.